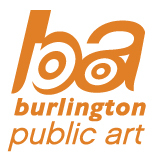 The mission of the City of Burlington’s Public Art Program is to enhance the quality of life in Burlington through the rich context of the arts. The program strives to bring artwork by both established and emerging artists to the city centre and the neighbourhoods throughout Burlington, Ontario. The Public Art Program provides cultural opportunity, guides the evolution of a vibrant artistic character for the City’s emerging public places, and ensures a visual legacy for all to enjoy. Burlington is an innovative and progressive community, built upon a strong sense of community pride. Burlington residents enjoy a high quality of life, where they can participate in a wide range of leisure and recreational pursuits. CoBALT Connects manages the City of Burlington’s Public Art Program. Guided by the Public Art Policy, Cobalt Connects works in cooperation with City of Burlington staff develop and implement the Public Art Master Plan. All public artworks accessioned by the Public Art Program are part of Burlington’s Public Art Inventory. Cobalt Connects is a non-profit organization that is the connecting element for creative communities. Through our Spaces, Consultation and Exchange programs we develop innovative facilities, projects and partnerships that advance the creative community.